As a trusted partner for companies, start-ups and universities we bring together close to 3,500 brilliant minds from over 70 nationalities. Imec is headquartered in Leuven, Belgium and also has distributed R&D groups at a number of Flemish universities, in the Netherlands, Taiwan, USA, China, and offices in India and Japan. All of these particular traits make imec to be a top-class employer. To strengthen this position as a leading player in our field, we are looking for those passionate talents that make the difference! 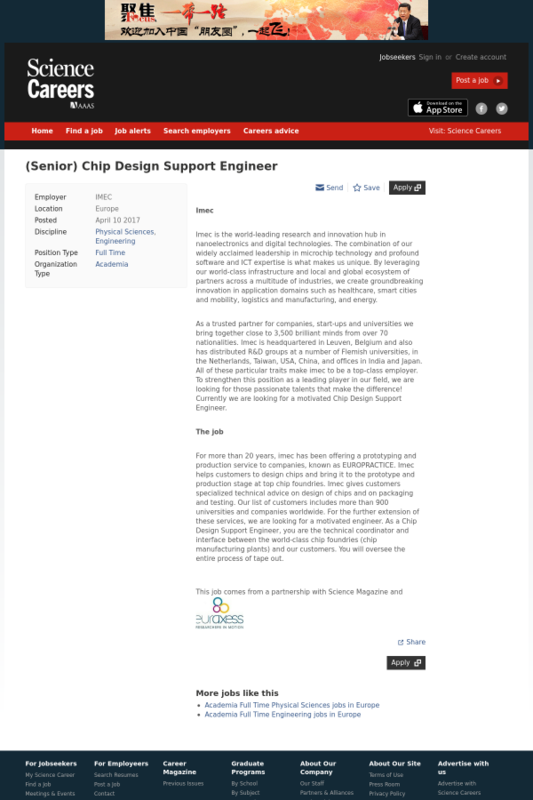 Currently we are looking for a motivated Chip Design Support Engineer. For more than 20 years, imec has been offering a prototyping and production service to companies, known as EUROPRACTICE. Imec helps customers to design chips and bring it to the prototype and production stage at top chip foundries. Imec gives customers specialized technical advice on design of chips and on packaging and testing. Our list of customers includes more than 900 universities and companies worldwide. For the further extension of these services, we are looking for a motivated engineer. As a Chip Design Support Engineer, you are the technical coordinator and interface between the world-class chip foundries (chip manufacturing plants) and our customers. You will oversee the entire process of tape out.